All in an aerosol formula perfect for use in tight indoor spaces. 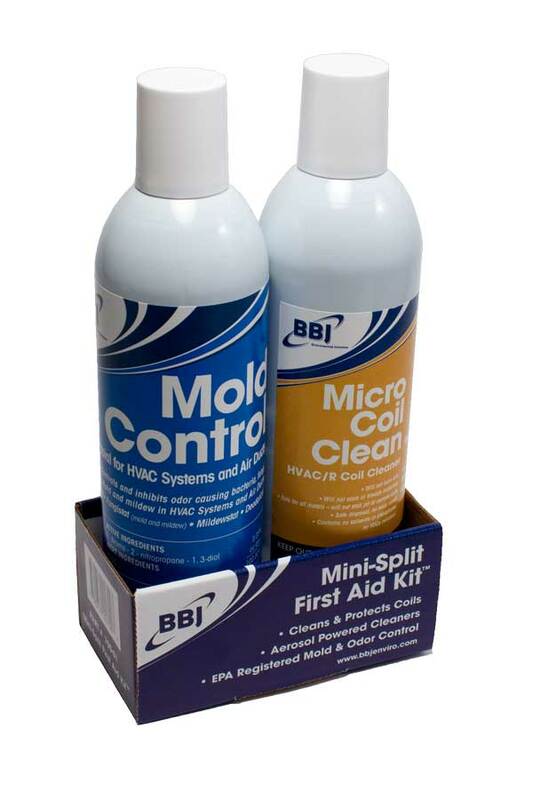 The Mini Split First Aid Kit™ includes aerosol versions of our popular Micro Coil Clean and BBJ Mold Control for HVAC Systems and Air Duct products. This duo provides the muscle you need for a mini split cleaning job. Micro Coil Clean: Non-caustic, detergent-based self-rinsing coil cleaner that has powerful surfactants to lift dirt and debris. Safe to use on even the most delicate coils but strong enough to remove stubborn deposits. Mold Control for HVAC Systems and Air Ducts: This EPA registered antimicrobial stops growth on coils, fans blades and other mechanical parts for up to one year when used as directed. Q: What makes this so special? there are many coil cleaners on the market. Their are few EPA registered fungistats labeled for HVAC use. There are none packaged as a complete kit to clean and protect ductless mini split systems. Q: Do I need to leave the area when applying Mold Control? No. 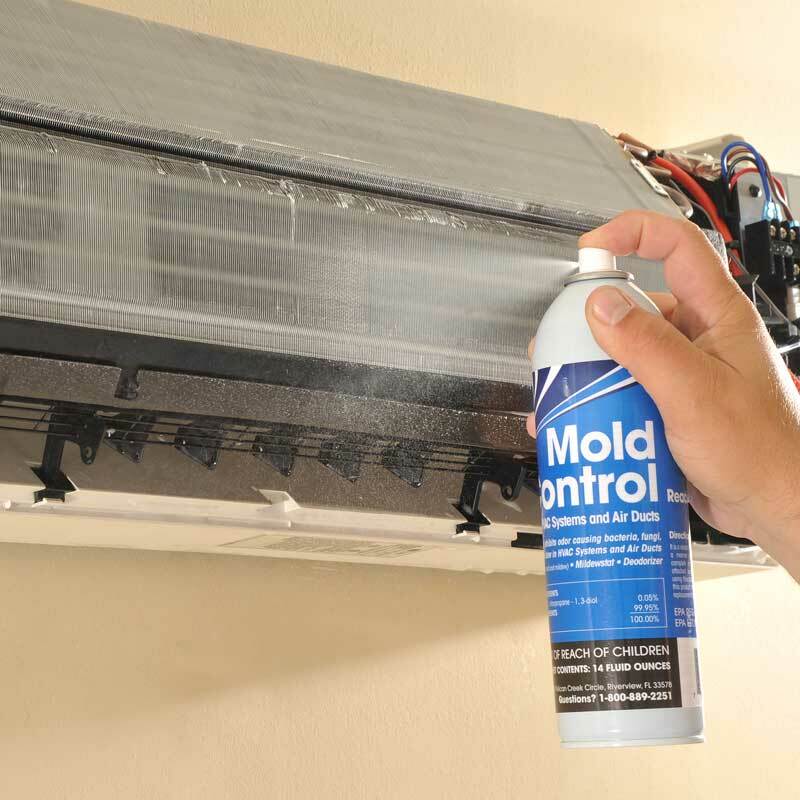 Mold control for HVAC Systems and Air Ducts is labeled for use while areas are inhabited. Q: do I need to rinse Micro Coil clean from coils after application? Yes, we recommend that you rinse coils of cleaner after a few minutes of application. Be careful to check that condensate lines are not blocked prior to rinsing. Q. How often should I clean coils? Maintenance of mini splits needs to occur on a similar calendar as maintaining standard air conditioning systems. This should occur twice a year in order to maintain system efficiency and indoor air quality. however many challenges exist to properly cleaning and maintaining mini split ductless systems. Size of coils, installation area and location above ground all offer challenges. Plus, if you plan to use wet cleaning for your coils you have to account for smaller condensate lines and pitch of the unit so you don’t flood the area. Some ductless systems have common problems with managing the water away from the coils leading to mold, mildew and odor problems.